Pilgun Oh, Minseong Ko, Seungjun Myeong, Youngsik Kim, & Jaephil Cho. The Li-rich cathode materials have been considered as one of the most promising cathodes for high energy Li-ion batteries. However, realization of these materials for use in Li-ion batteries is currently limited by their intrinsic problems. To overcome this barrier, a new surface treatment concept is proposed in which a hybrid surface layer composed of a reduced graphene oxide (rGO) coating and a chemically activated layer is created. A few layers of GO are first coated on the surface of the Li-rich cathode material, followed by a hydrazine treatment to produce the reducing agent of GO and the chemical activator of the Li2MnO3 phase. Compared to previous studies, this surface treatment provides substantially improved electrochemical performance in terms of initial Coulombic effiency and retention of discharge voltage. As a result, the surface-treated 0.4Li­2MnO3–0.6LiNi1/3Co1/3Mn1/3O2 exhibits a high capacity efficiency of 99.5% during the first cycle a the discharge capacity of 250 mAh g−1 (2.0–4.6 V under 0.1C), 94.6% discharge voltage retention during 100 cycles (1C) and the superior capacity retention of 60% at 12C at 24 °C. 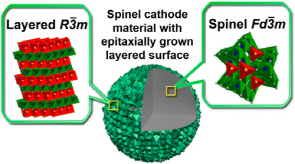 A novel energy conversion and storage system using seawater as a cathode is proposed herein. This system is an intermediate between a battery and a fuel cell, and is accordingly referred to as a hybrid fuel cell. The circulating seawater in this open-cathode system results in a continuous supply of sodium ions, which gives this system superior cycling stability that allows the application of various alternative anodes to sodium metal by compensating for irreversible charge losses. Indeed, hard carbon and Sn-C nanocomposite electrodes were successfully applied as anode materials in this hybrid-seawater fuel cell, yielding highly stable cycling performance and reversible capacities exceeding 110 mAh g−1 and 300 mAh g−1, respectively. 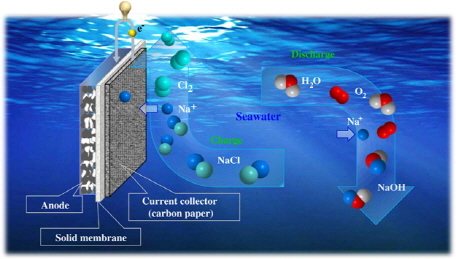 In this work, the design of a new metal-free hybrid seawater fuel cell consisting of a flowing seawater cathode and a hard carbon anode was proposed. The electrochemical performance of the cell was investigated with two different electrolytes, i.e., 1 M NaClO4 in ethylene carbonate (EC)/propylene carbonate (PC), and 1 M NaCF3SO3 in tetraethylene glycol dimethyl ether (TEGDME). The TEGDME-based electrolyte showed a good cycle performance for 100 cycles, whereas EC/PC showed poor cycle stability after 30 cycles. Our results showed that a low conducting solid-electrolyte interphase (SEI) was formed with a thick layer, and the PVdF binder was degraded during the redox reaction when the EC/PC-based electrolyte was used. In contrast, the TEGDME-based electrolyte induced the formation of a more efficient SEI layer without degradation of the binder. Recent studies on all-vanadium redox flow batteries (VRFBs) have focused on carbon-based materials for cost-effective electrocatalysts to commercialize them in grid-scale energy storage markets. We report an environmentally friendly and safe method to produce carbon-based catalysts by corn protein self-assembly. This new method allows carbon black (CB) nanoparticles to be coated with nitrogen-doped graphitic layers with oxygen-rich functionalities (N-CB). We observed increased catalytic activity of this catalyst toward both V2+/V3+ and VO2+/VO2+ ions, showing a 24% increased mass transfer process and ca. 50 mV higher reduction onset potential compared to CB catalyst. It is believed that the abundant oxygen active sites and nitrogen defects in the N-CB catalyst are beneficial to the vanadium redox reaction by improving the electron transfer rate and giving faster vanadium ion transfer kinetics. Electrochimica Acta, 2014, 143, 272-277. This study investigates the electrochemical sodium insertion/extraction of NaxVS2, and NaxTiS2 in the voltage range where either intercalation (0.2 ≤ x ≤ 1) or displacement-conversion reaction (x > 1) occurs. Both NaxVS2 and NaxTiS2 showed good reversible capacities, as high as ∼160 mAh/g at an average voltage of ∼1.9 V vs. Na in the region for the intercalation reaction (0.2 ≤ x ≤ 1). 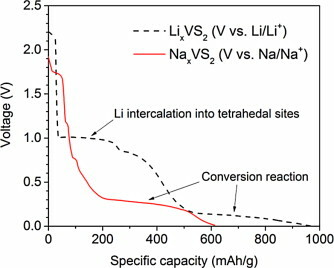 When sodium (Na) insertion was forced further to the x > 1 composition, NaxVS2 exhibited the direct displacement-conversion reaction at 0.3 V vs. Na without further Na intercalation, which contrasted with the wider lithium intercalation range of 0 < x ≤ 2 for LixVS2. The displacement-conversion reaction for NaxVS2 (x > 1) was reversible with a specific capacity of above 200 mAh/g up to 15 cycles, but the displacement reaction for NaxTiS2 (x > 1) was not observed. Nano Today, 2014, 9(5), 604-630. High performance lithium batteries are in great demand for consumer electronics, electric vehicles and grid scale stationary energy storage. Transition metal sulfides based on conversion or alloying reactions have drawn much attention because of their significantly higher specific capacity than traditional insertion electrode materials. However, their poor cyclability caused by the large volume change during the lithium (Li) up-taking and extraction has hindered their further developments and applications in Li rechargeable batteries. This review outlines the fundamental mechanisms and obstacles of the transition metal sulfides associated with Li storage through conversion reaction and also discusses how the nanostructure design can successfully address their challenges. Recent progresses in the nanoparticle synthesis, nanostructure design, composite fabrication, and their effects on the electrochemical performances are summarized and discussed. In addition, remaining challenges and possibilities for further improvements are also prospected. In order to achieve high-power and -energy anodes operating above 1.0 V (vs Li/Li+), titanium-based materials have been investigated for a long time. However, theoretically low lithium charge capacities of titanium-anodes have required new types of high-capacity anode materials. As a candidate, TiNb2O7 has attracted much attention due to the high theoretical capacity of 387.6 mA h g–1. However, the high formation temperature of the TiNb2O7 phase resulted in large-sized TiNb2O7 crystals, thus resulting in poor rate capability. Herein, ordered mesoporous TiNb2O7 (denoted as m-TNO) was synthesized by block copolymer assisted self-assembly, and the resulting binary metal oxide was applied as an anode in a lithium ion battery. The nanocrystals (∼15 nm) developed inside the confined pore walls and large pores (∼40 nm) of m-TNO resulted in a short diffusion length for lithium ions/electrons and fast penetration of electrolyte. As a stable anode, the m-TNO electrode exhibited a high capacity of 289 mA h g–1 (at 0.1 C) and an excellent rate performance of 162 mA h g–1 at 20 C and 116 mA h g–1 at 50 C (= 19.35 A g–1) within a potential range of 1.0–3.0 V (vs Li/Li+), which clearly surpasses other Ti-and Nb-based anode materials (TiO2, Li4Ti5O12, Nb2O5, etc.) and previously reported TiNb2O7 materials. The m-TNO and carbon coated m-TNO electrodes also demonstrated stable cycle performances of 48 and 81% retention during 2,000 cycles at 10 C rate, respectively. Impressive developments have been made in the past a few years toward the establishment of Na-ion batteries as next-generation energy-storage devices and replacements for Li-ion batteries. Na-based cells have attracted increasing attention owing to low production costs due to abundant sodium resources. However, applications of Na-ion batteries are limited to large-scale energy-storage systems because of their lower energy density compared to Li-ion batteries and their potential safety problems. Recently, Na-metal cells such as Na–metal halide and Na–air batteries have been considered to be promising for use in electric vehicles owing to good safety and high energy density, although less attention is focused on Na-metal cells than on Na-ion cells. This Minireview provides an overview of the fundamentals and recent progress in the fields of Na–metal halide and Na–air batteries, with the aim of providing a better understanding of new electrochemical systems. Electrocatalysts facilitating oxygen reduction reaction (ORR) are vital components in advanced fuel cells and metal-air batteries. 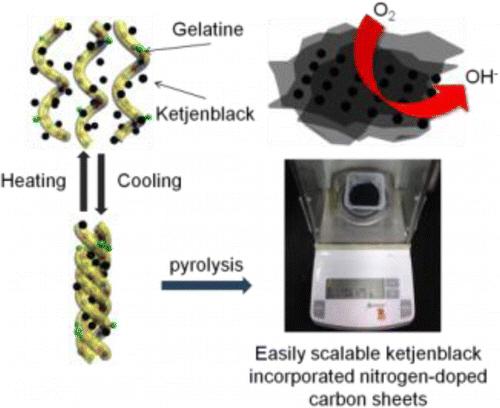 Here we report Ketjenblack incorporated nitrogen-doped carbon sheets derived from gelatin and apply these easily scalable materials as metal-free electrocatalysts for ORR. These carbon nanosheets demonstrate highly comparable catalytic activity for ORR as well as better durability than commercial Vulcan carbon supported Pt catalysts in alkaline media. Physico-chemical characterization and theoretical calculations suggest that proper combination of graphitic and pyridinic nitrogen species with more exposed edge sites effectively facilitates a formation of superoxide, [O2(ad)]−, via one-electron transfer, thus increasing catalytic activities for ORR. Our results demonstrate a novel strategy to expose more nitrogen doped edge sites by irregular stacked small sheets in developing better electrocatalysts for Zn-air batteries. These desirable architectures are embodied by an amphiphlilic gelatin mediated compatible synthetic strategy between hydrophobic carbon and aqueous water. A new thio-germanium sulfide Li2GeGa2S6 (LGGS) has been synthesized for the first time. In order to determine the structure of the LGGS, the material was synthesized by being melted in a carbon-coated silica tube and being slowly cooled to make a crystalline structure. X-ray diffraction (XRD) was performed. The experimental XRD powder pattern of the LiGeGa2S6 appears to closely match the calculated data, Joint Committee on Powder Diffraction Standards (JCPDS). The host structure is built of GaS4 tetrahedra linked by corners to GeS4 tetrahedra to create a 3D framework forming tunnels along the c-axis, in which the Li+ ions are located. To further characterize the structure of the phase, the Raman and infrared (IR) spectra of LGGS were performed. The strongest intensity peak in the Raman spectra is observed at ~ 337 cm–1 assigned to symmetric stretch vibrations of S atoms (Ge–S–Ge symmetrical bridge-stretching mode) in GeS4 and GaS4 units. This symmetric sulfur bridge stretching mode is also observed at ~ 338 cm− 1 in the IR spectra. The ionic conductivities of the LGGS were conducted with various temperatures. The ionic conductivity of 3.8 × 10− 8 S/cm was observed at room temperature. Electrochemical stability was evaluated from the cyclic voltammogram of a Li/Li2GeGa2S6/Au cell with a lithium reference electrode. The material shows high decomposition potential up to 6 V.
A Li (ion)–air cell was designed to investigate the reversible utilization of Li that was harvested from a cathode. 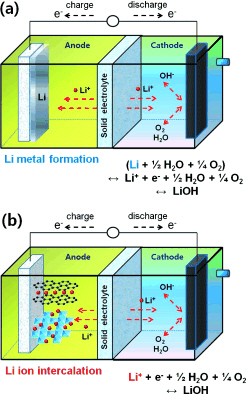 In the Li (ion)–air cell, 0.1 M LiOH(aq) was used as the catholyte with oxygen in air and Li intercalation compounds such as graphite (C6) and Li4Ti5O12 (LTO) were used as the anodes. It appeared that the Li metal formed on the stainless-steel anode in the first charge of the Li–air cell was poorly reversible in further cycling owing to irreversible loss of Li during cycling. However, when Li intercalation compounds were used as anodes in a Li-ion–air cell, high coulombic efficiency by reversible reactions and good cycle performance were achieved. These results show that Li intercalation materials have significant potential as anode materials since they effectively utilize Li resources in Li–air battery systems and ensure reversibility in these systems. Among the various Ni-based layered oxide systems in the form of LiNi1-y-zCoyAlzO2 (NCA), the compostions between y = 0.1–0.15, z = 0.05 are the most successful and commercialized cathodes used in electric vehicles (EVs) and hybrid electric vehicles (HEVs). However, tremendous research effort has been dedicted to searching for better composition in NCA systems to overcome the limitations of these cathodes, particularly those that arise when they are used use at high discharge/charge rates (>5C) and in high temperature (60 °C) environments. In addition, improving the thermal stability at 4.5 V is also very important in terms of the total amount of heat generated and the onset temperature. Here, a new NCA composition in the form of LiNi0.81Co0.1Al0.09O2 (y = 0.1, z = 0.09) is reported for the first time. Compared to the LiNi0.85Co0.1Al0.05O2 cathode, LiNi0.81Co0.1Al0.09O2 exhibits an excellent rate capability of 155 mAh g−1 at 10 C with a cut-off voltage range between 3 and 4.5 V, corresponding to 562 Wh kg−1 at 24 °C. It additionally provides significantly improved thermal stability and electrochemical performance at the high temperature of 60 °C, with a discharge capacity of 122 mAh g−1 after 200 cycles with capacity retention of 59%. A facile hydrothermal route has been developed to prepare graphene–Co3O4 nanocomposites. The graphene–Co3O4 nanocomposite catalyst demonstrates an excellent catalytic activity toward oxygen-reduction reaction including a considerably more positive half-wave potential (−0.23 V) than that of pristine graphene (−0.39 V), as well as higher cathodic currents. More importantly, this catalyst shows better long-term durability than the commercial Pt/C catalyst in an alkaline solution. The preliminary results indicate that the graphene–Co3O4 nanocomposite is an efficient and stable bifunctional catalyst for Li–air batteries and may be an alternative to the high-cost commercial Pt/C catalyst for the ORR/OER in alkaline solutions. This work has been performed to determine the critical size of the GeO2 nanoparticle for lithium battery anode applications and identify its quantum confinement and its related effects on the electrochemical performance. GeO2 nanoparticles with different sizes of ∼2, ∼6, ∼10, and ∼35 nm were prepared by adjusting the reaction rate, controlling the reaction temperature and reactant concentration, and using different solvents. 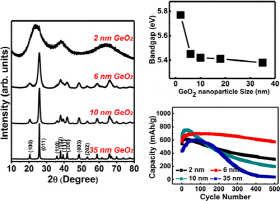 Among the different sizes of the GeO2 nanoparticles, the ∼6 nm sized GeO2 showed the best electrochemical performance. Unexpectedly smaller particles of the ∼2 nm sized GeO2 showed the inferior electrochemical performances compared to those of the ∼6 nm sized one. This was due to the low electrical conductivity of the ∼2 nm sized GeO2 caused by its quantum confinement effect, which is also related to the increase in the charge transfer resistance. Those characteristics of the smaller nanoparticles led to poor electrochemical performances, and their relationships were discussed. Tremendous research works have been done to develop better cathode materials for a large scale battery to be used for electric vehicles (EVs). Spinel LiMn2O4 has been considered as the most promising cathode among the many candidates due to its advantages of high thermal stability, low cost, abundance, and environmental affinity. However, it still suffers from the surface dissolution of manganese in the electrolyte at elevated temperature, especially above 60 °C, which leads to a severe capacity fading. To overcome this barrier, we here report an imaginative material design; a novel heterostructure LiMn2O4 with epitaxially grown layered (R3̅m) surface phase. 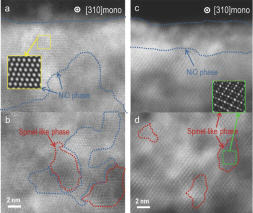 No defect was observed at the interface between the host spinel and layered surface phase, which provides an efficient path for the ionic and electronic mobility. 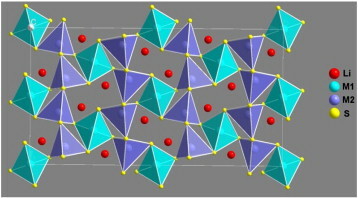 In addition, the layered surface phase protects the host spinel from being directly exposed to the highly active electrolyte at 60 °C. 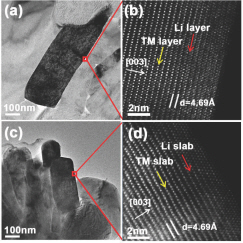 The unique characteristics of the heterostructure LiMn2O4 phase exhibited a discharge capacity of 123 mAh g–1 and retained 85% of its initial capacity at the elevated temperature (60 °C) after 100 cycles. In this work, we demonstrate a lithium-water battery that uses oxygen dissolved in water as a cathode, Sr0.95Ce0.05CoO3-δ (SCCO)-copper nanoparticles as an efficient bifunctional catalyst, and with hybrid electrolytes. The SCCO-Cu composite catalyst exhibits an efficient and stable bifunctional catalytic activity, especially for the OER. The round-trip efficiency of the cell with SCCO-Cu nanoparticles catalyst reaches 84.1%, close to that of the 50% Pt/carbon-black catalyst (87.2%). The improved performance of the SCCO-Cu catalyst can be ascribed to the synergetic effect of SCCO and copper. 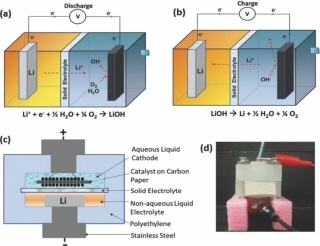 The preliminary results demonstrate that the rechargeable lithium-water battery with oxygen dissolved in water flow can be achieved with high efficient and low cost oxide catalyst. This can be a good candidate for a large stationary energy storage system (ESS) with a low-cost.